Oftentimes, multiple people must touch a form before it is completed. For instance, a technician may fill out the bulk of a work order, and then pass it off to their supervisor to sign off and complete the form. GoFormz supports this kind of workflow by allowing you to transfer a draft form to another user in your account, or to a predefined group of users. To learn more about user groups and permissions, see the Managing User Permissions tutorial. Note that only Draft forms can be transferred — Completed forms cannot be transferred. 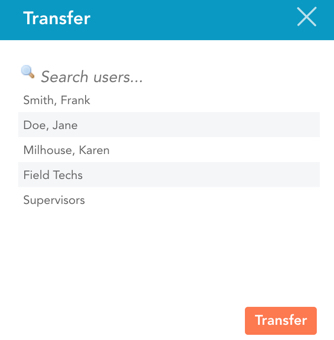 You can transfer your form to another user in your account using either the mobile app, or the form editor in the web interface. In the mobile app: Expand the [...] Actions menu in either the Forms List or the Form Editor/Viewer, then tap the Transfer button. to the Form Actions screen by tapping the Actions button in either the Forms browser or the mobile Form Editor. Then tap the Transfer button. In the Web Form Editor: Click the Transfer icon in the left-hand sidebar. From here, simply select the user or group that should receive the form to complete the transfer. For details and screenshots of how to transfer a form on your specific mobile platform, refer to our Mobile App User Guide. The Internet tab shows all users and groups in your organization. The Local Network tab shows all users on your WiFi network who are also members of your organization. If you don’t see your target user listed, you also have the option to add the user using their IP address. When you transfer a form to another user, the form will immediately disappear from your Drafts and appear in the other user’s Drafts, allowing them to edit it as needed. Use case: In the screenshot above, suppose Jane Doe is your supervisor, and needs to sign off on your form. You can transfer the form directly to Jane for her approval. When you transfer a form to a group of users, the form will disappear from your Drafts and appear as a Shared form for all users in the group that you selected. In the mobile app, the form will appear in the Form List's Shared tab for all users in the group. To take ownership of the form, simply tap on the form in the Shared tab. This moves the form to the Drafts tab, allowing you to make changes. For details on how to receive a transferred form on your specific mobile platform, refer to our Mobile App User Guide. In the web interface, the form will appear in the Forms Tab for all users in the group, with the group name as the owner. To take ownership, open the form in the Form Editor, make some changes, and save. The Forms Tab will now show your name as the form owner, rather than the group name. Once a user takes ownership of the form, other users in the group will no longer be able to take ownership — unless the new owner chooses to transfer the form back to the group. This ensures that two people can never edit the same form at the same time, creating a conflict. Use case: Suppose your company policy is that a supervisor needs to sign off on your form, but it doesn’t matter which supervisor. In this case, you can simply assign your form to the Supervisors group, and the first one to see it can claim ownership and sign off on it.